Choose your zodiac sign and enjoy the horoscope. In our horoscopes you will discover the perfect opportunities, weaknesses and challenges that are drawn by an invisible hand of fate on the life's journey of each of us. Aries, during November you will experience complete rebirth; regaining your mental and physical forces. But there is a catch. Every newly born baby is inexperienced and vulnerable. A fresh spring of energy spilling out of your heart may drown out some important messages that will come to your ears. The horoscope advises: rejoice all the endorphins that will circulate in your veins, but do not forget being alert and sensitive to details. The main news headlines will not tell you that someone close is disappointed or feeling underestimated. Taurus, your creative talent and inspiration will be on the rise in November. However, you do not have to take part in any literary competition. Frankly, leave the Pulitzer Prize to others. A great piece of work can be a corporate annual report, a letter to the ministry, an email to a popular actor or actress, or a letter to a good friend. Anyway, you can easily take friend's breath away by reporting about the yesterday part of a culinary series as if it were a real Hollywood blockbuster. The November Horoscope for 2018 recalls that long peaceful periods are often alternated with an earthquake. If you just experienced one at work or at home, then you probably exhausted all the necessary amount of excitement and uncertainty. However, the horoscope encourages Gemini, you should be more focused on an arrival of a fire brigade, rather than looking for a new wellness centre in your free time. Just joking, really, nothing terrible will happen, but ... Gemini, be prepared that November will bring excitement and adrenaline, rather than boredom and sleepy autumn. That's all. The November horoscope suggests that Cancer will surely be singing and dancing. Your appearance, full of positive energy, will remind a mighty blooming tree, whose sweet nectar lures bees and butterflies. Love, partnership, and marriage will turn into a swing concert where all the instruments fit perfectly together and form loud and harmonious melody. Only Frank Sinatra will be absent, but the November horoscope tells that you may substitute him excellently. A marble slab that symbolizes the strength and resilience of the Lion may once serve as the central part of a monument that future generations will build to you. In November, Leo has a unique chance to switch the points on the history track, or at least to carry out an unforgettable deed for which he or she gains the admiration of many descendants. Perhaps we do not overreact when we give the people born in Leo such a strong November motivation. The November horoscope shows that Virgo can look forward to the answers they have long expected. Perhaps you are only bothered by the right recipe for a marble cake, maybe you are looking for an effective treatment of prolonged health problems, maybe you do not know whom to choose as the prince or princess of your life. Anyway, whether it's a triviality or a real problem, the eleventh month of 2018 will bring Virgo the explanation and peace of mind. Scorpio, solid health, friendly mind and perfect concentration are, according to horoscope, key pillars of your success in November. Simple recommendations are following: don't let your attention distract by anyone. Are you enjoying ads for useless and impulsive purchases? Turn them off! Do you feel that you are neglecting real personal contact with friends at the expense of writing more over the internet? Sign out from Facebook and Twitter! Do you eat only meat and sausages instead of fruit and vegetables? Impose a fine and contribute for every single violation to a charity! 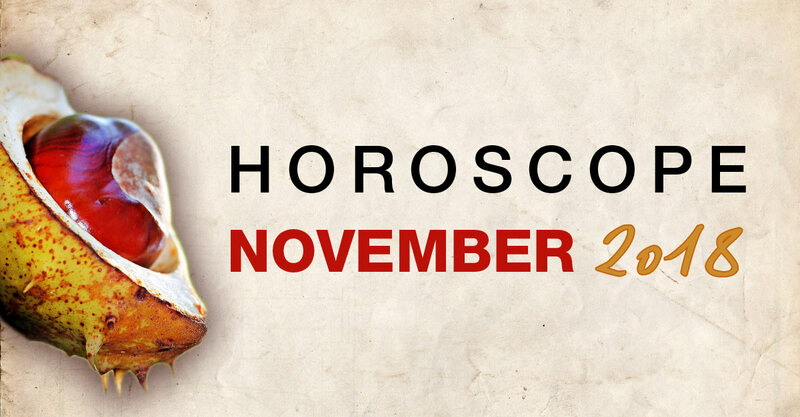 The horoscope predicts that with a little self-discipline Scorpio will be very happy for the whole of November. Sagittarius, don't be bothered by depressing thoughts during November. If you will be in bad mood, go for jog or just walk outside. Desired wind of positive change may also be a solving of some mystery. A classic detective story by Agatha Christie, a deep search in your genealogy, or an attempt to solve the crucial question of whether or not global warming really occurs. But back to the ground, the horoscope reveals that Sagittarius will enjoy an excellent "sixth sense" that will lead them to the right track. It seems that you will not be given the knighthood by Queen Elizabeth, but this does not matter at all. Do not be afraid, Capricorn still has unique prospects offered by the November horoscope. People who get to your immediate nearness should beware of the risk of electric shock. Why? Capricorn will be literally charged with "high voltage" energy. It will become evident in your jokes, ideas, and overall vitality. If you encounter a bear while walking in the mountains, be sure that even this wild animal will escape when noticing your bold character. Aquarius, the horoscope for November 2018, points out the fact, that the medieval bloodletting is quite obsolete and very questionable healing practice. Your health seems now to be one from the top concerns. Nevertheless, this month you should be very careful about archaic healing practices and quackery. Herbs and natural medicine are surely positive, but your precious body is not a rough bag that needs rough patches that will remain visible forever. The horoscope advises: you should show the effort to get as many opinions as possible, and do not succumb to the first advice that comes to you. But it is not only a question of health – a poor investment or life choice can also "hurt" long and noticeably. Pisces, if there is a month suitable for jokes, then it is especially November 2018. Lack of light and cool weather often ruins other signs of the zodiac, but not Pisces. What mother's milk means to mammals, the same means fun to Pisces! So, don't hesitate to make jokes and laugh, but please with certain respect to others. If you will hurt beloved with socially inappropriate fun, they will strike back, and you will repay everything back even with a high "interest rate".